Golf is best played in a beautiful place on a sunny day. But while Bellingham’s golf courses certainly have the beauty, they can’t always promise the sunshine. It would be easy to say Joe’s Professional Golf Lab and Indoor Golf Center on Hannegan Road is the best place to play golf when the rain is beating down but, to be honest, this place is really cool whatever the weather. Come here for instruction from a guy who used to teach at Pebble Beach and Spyglass Hill in Monterey, Calif. Come to have your clubs fitted using the latest FlightScope Pro hardware and software. 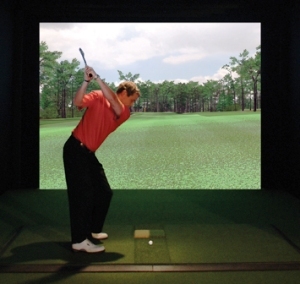 Have your clubs repaired, re-gripped and re-shafted, swing by for an hour’s practice on one of three aboutGolf simulated driving ranges, or play a virtual round at one of more than 50 courses including Pebble Beach for which Joe might be able to give you some helpful local knowledge. (See Joe’s instruction page for a brief bio). 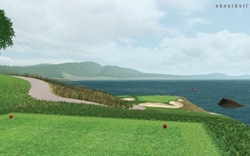 You can play the 7th at Pebble Beach. Just don't go right!